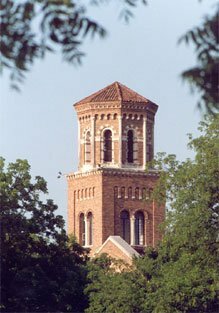 Since its founding in 1922, Midwestern State University has grown from a local junior college to a regional state university serving a wide and varied public. Created in 1922 as Wichita Falls Junior College, the second municipal junior college in Texas, its earliest home was in Wichita Falls High School with which it shared both the building and faculty. Later, a legislative act and a vote of the people of Wichita Falls set up a separate tax district to support the junior college. In 1937, the college acquired a new, 40-acre campus of its own on the south side of town. Rising above the pastures and wheat fields was the recently finished Hardin Building, an impressive Spanish colonial structure which was presided over by a lofty bell tower. Also in that year the college was renamed Hardin Junior College in honor of Mr. and Mrs. John G. Hardin. During World War II, the establishment of Sheppard Field, later renamed Sheppard Air Force Base, added to the college’s public. Since that time, air base personnel and their families have been continuing participants in the campus academic programs. The post World War II years brought more change in the school’s mission and in its name. In 1946, the senior college division was added and accordingly the name was altered to Hardin College. In January 1950, the name changed to Midwestern University, the junior division remaining Hardin Junior College. In these years, wider recognition came to the school. In March 1948, the university became a member of the Association of Colleges and Secondary Schools. In January 1959, the university added a graduate school, which received full approval from the State Board of Education in August of that year. A further change in the school’s status came September 1, 1961, when by action of the 56th Legislature of the State of Texas, Midwestern University became a part of the Texas Colleges and Universities System and the junior college division was dissolved. In 1975, the Texas Legislature changed the name to Midwestern State University. From its beginnings as a municipal junior college housed in a high school building, Midwestern has become a state university whose campus of 255 acres and 70 buildings offers a wide variety of academic programs in liberal and fine arts, mathematics, sciences, business, and applied sciences.